We joined the NDSAN registry in April, 2018. We had felt called to adoption for some time, but it took us awhile to find out exactly what that should look like for our family. Working with the NDSAN just made so much sense for our family, and having Stephanie just an email or phone call away made all the difference to adoption newbies like us! After waiting on the registry for about three months, we got the call that we had been chosenby a birth mother. At that moment, I was driving home from a day at the park with our four bio kids, and honestly I don't even remember all of what I said...I just remember that it felt like it couldn't possibly be real, and I was basically yelling into the phone...which was confusing for the kids in the back, and probably damaging to poor Stephanie's hearing (Sorry, Stephanie!). Baby T was due on Oct 23rd, and we decided to all fly down a little before his due date to get a chance to meethis birthparents before his arrival, and to be able to include the "big kids" on the adventure.It was discovered that he was in distress and that birth mom would need to be induced. She invited me to come, which is such an amazing gift most adoptive mothers don't get to have, and yes, I absolutely cried when she said she'd like me to be there. It turned into a long night of pre-labor not going well, and in the wee hours of the morning it became plain that T was not going to tolerate actual labor and needed a C-section for his safety. She was allowed one support person in the operating room, and as his birthfather was not there, I got to be in the room holding her hand as our son entered the world.It will forever be one of the most amazing, beautiful experiences of my life. One of the nurses actually cried. This baby was welcomed into the world by the two people in the world who love him the way only a mother can. We were told many times by different hospital staff over the next few weeks that they never saw a relationship between a birth mother and an adoptive mother as close as ours, but it feels so natural to me. I love our son's birth mom, because she chose life for him, and she loves him enough to know that she couldn't give him what he needs, and so chose us with the unimaginable gift of raising the baby she loves. She loves us, because she knows we love him and will spend the rest of our lives loving and caring for him. How could we not love each other when we are connected by such a strong bond? Baby T was born, and he was beautiful. None of us can imagine life without him. His birth mother and I text each other a few times a week, and we are already planning a visit next winter! 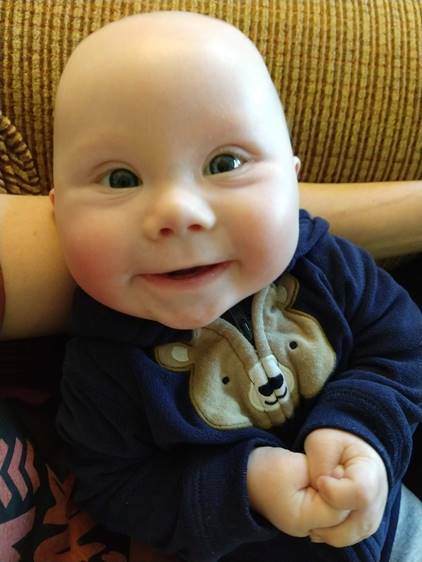 This little guy is growing up surrounded by people who love him...and I think he knows it.